FurReal Friends brings you pretend pet play with plush animatronic pets that children love. The variety of features that our different pets display can make you want to snuggle, play, and laugh out loud! Butterscotch, My Walkin’ Pony is a brand new pet that walks and makes sweet pony sounds. Now you can own your very own pony! She’ s not just any pony. She’s Butterscotch! Meet Butterscotch, My Walkin’ Pony, a new FurReal Friends plush pony that really walks. When you pet her back, she will walk toward you and make sweet pony sounds. You’ll love to have her walking by your side with her beautiful mane and tail. She loves nothing more than spending time with her favorite friends. Together, you and Butterscotch, My Walkin’ Pony, can laugh and play and find adventure every day! Groom her beautiful mane and tail with the included comb and accessories to make Butterscotch, My Walkin’ Pony, look her absolute best! Once you have her luscious mane looking just right, you can add her beautiful flower accessory for that special touch. You can even wear it yourself as a pretty flower ring to show Butterscotch how much you love being her friend. Butterscotch, My Walkin’ Pony, is a very special member of the FurReal Friends pet family, and you can be too! When you pet her back, Butterscotch, My Walkin’ Pony, makes sweet, pony sounds that let you know that she wants to be your friend. 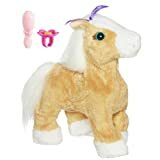 This golden plush pony also has a poseable head that you can move in different positions as you groom her mane and get ready for your next adventure together. 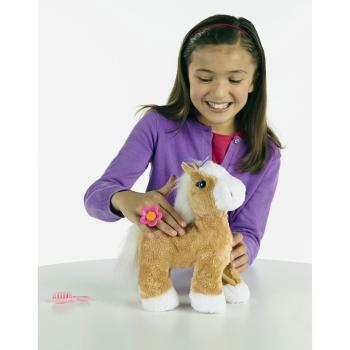 Butterscotch, My Walkin’ Pony plush pony, flower accessory, and pet care guide.